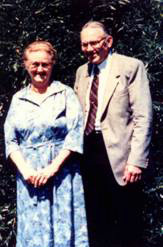 Gordon Buschert: minister of the West Zion Mennonite Church near Carstairs, Alberta, was born near Carstairs on 12 September 1917 and died 8 July 1987 just two miles from where he was born. He married Mildred Maurer on 14 July 1940. Gordon Buschert only completed Grade 9 in public school, but supplemented his education when he attended the Winter Bible School of the Alberta-Saskatchewan Mennonite Conference. He also took a short Bible course at the Hesston Academy in Hesston, Kansas. In 1949 he took further classes and graduated from the Ontario Mennonite Bible School in Kitchener, Ontario. He was a farmer who took an active interest in the work of the West Zion Mennonite Church where he taught Sunday school and served on the Mission Board. He was chosen by lot and ordained as a minister in the congregation on 2 May 1948. He served the congregation for the next 25 years. After his retirement from the pastorate he and his wife spent time in Voluntary Service where Gordon served as Administrative Assistant at the Glencroft Retirement Centre in Phoenix, Arizona. After that term of service the Busherts returned to the Carstairs district where Gordon died in 1987. Gordon Buschert served in many ways in the Alberta-Saskatchewan Mennonite Conference, including as secretary of the Mission Board and as Vice-President of the Conference. He had a great interest in missions, encouraging and supporting several members of the congregation to enter missionary service. He demonstrated love and skill as a conciliator who provided steady leadership in the congregation. Regehr, T. D. Faith, Life and Witness in the Northwest, 1903-2002. Centennial History of the Northwest Mennonite Conference. Kitchener, ON : Pandora Press, 2003. Harder, Richard, ed. West Zion Mennonite Church: Centennial Scrapbook, 1901-2001. Carstairs, Alberta : West Zion Mennonite Church, 2000: 44. Stauffer, Ezra. History of the Alberta-Saskatchewan Mennonite Conference. Ryley , Alberta : Alberta-Saskatchewan Mennonite Conference, 1960: 57. "Two Leaders Leave Their Mark," and "A Tribute to Gordon Buschert." Northwest Conference of the Mennonite Church Newsletter. Vol. 4, No. 3 (Fall 1987): 1. Regehr, Ted D. "Buschert, Gordon (1917-1987)." Global Anabaptist Mennonite Encyclopedia Online. December 2003. Web. 19 Apr 2019. http://gameo.org/index.php?title=Buschert,_Gordon_(1917-1987)&oldid=122454. Regehr, Ted D. (December 2003). Buschert, Gordon (1917-1987). Global Anabaptist Mennonite Encyclopedia Online. Retrieved 19 April 2019, from http://gameo.org/index.php?title=Buschert,_Gordon_(1917-1987)&oldid=122454. This page was last modified on 23 May 2014, at 18:50.